This healthy Gazpacho soup recipe is so easy and delicious, you will want to eat it all year. 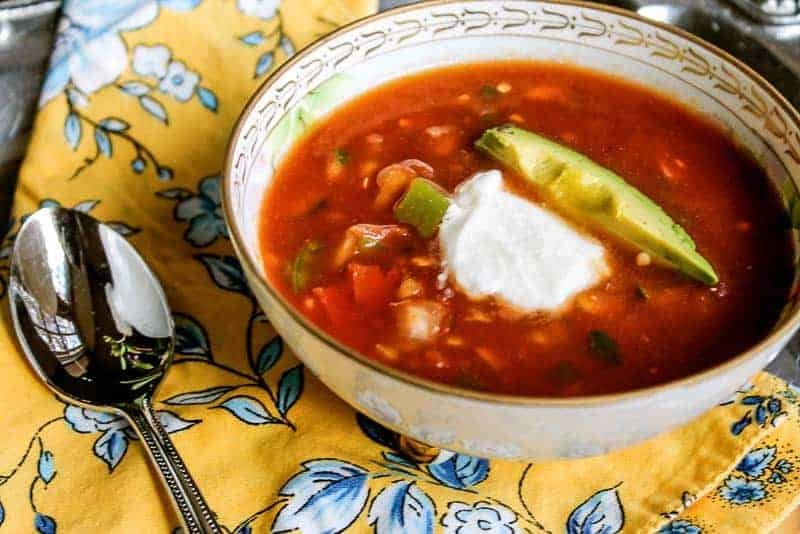 This is a lovely, fresh, chunky, homemade, and healthy Gazpacho Soup Recipe made best with the ripe vegetables straight from the garden. 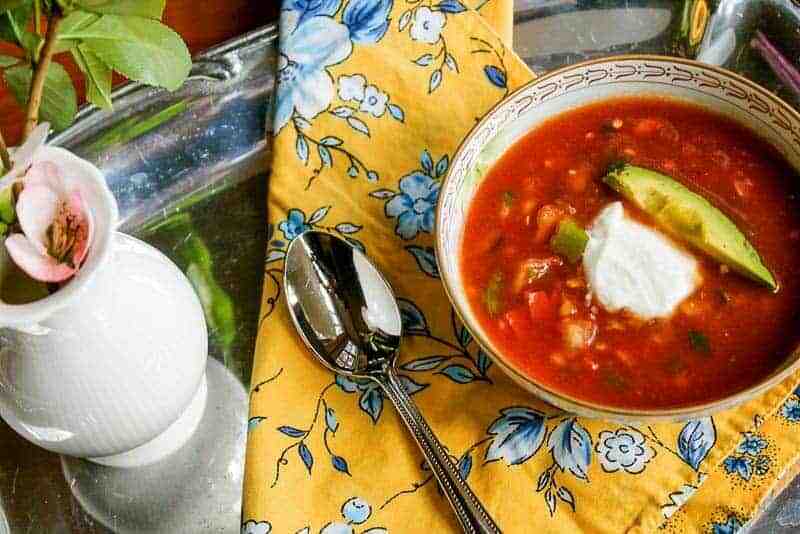 One summer, I was visiting my Aunt Sue Kaat in Wautoma, Wisconsin when she was preparing this healthy Gazpacho Soup recipe for a sick friend. My Aunt Sue is a sweet little lady who eats very healthy and looks amazing to prove it. I had never had a Gazpacho Soup. Previously, the “cold” soup idea had always repelled me. I grew up thinking that soup was meant to be served hot and any soup that wasn’t hot, was simply not soup… However this colorful, vibrant, beautiful creation intrigued me; and being the nosey, curious person that I am, I asked for a bite. I instantly fell in love! It was fresh, bursting with flavor, with a small hint of spicy heat to it. My curiosity paid off. I have been trying all kinds of cold soups ever since. This healthy Gazpacho Soup recipe has become a favored recipe that I use all spring and summer. It takes only a few minutes to put together. I often make it in the beginning of the week and bring it work for lunch. It is perfect for work lunches because you don’t have to heat it. The fact that it is healthy is an added bonus. The key to this healthy Gazpacho soup recipe is the Spicy V8. Make sure this is the brand and flavor you use for this soup recipe. It will not be the same with a knock off brand. I know from experience. I was at a store that did not carry V8 and in my laziness, I bought a knock off brand. It wasn’t nearly as good. Lesson learned. You have been warned! Enjoy! Did you enjoy this healthy Gazpacho soup recipe? For more delicious, healthy, easy soup options check out these recipes: Carrot Ginger Soup, The Best Tomato Basil Soup, and Tiered Tomato Soup Shooters. 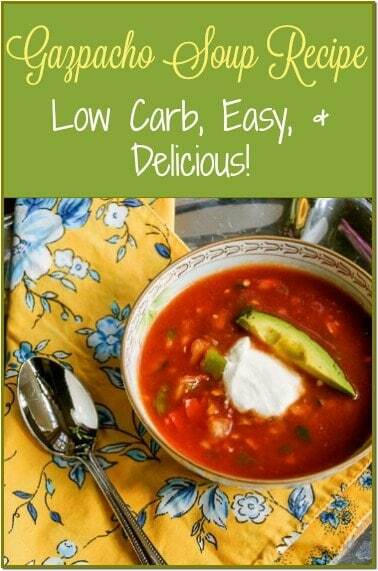 This is a lovely, fresh, chunky, homemade, and healthy Gazpacho soup recipe! It's easy to make and incorporates all the right vegetables to keep your heart healthy and vibrant. It's also low in carbs. Chop tomatoes, cucumbers, green pepper, red pepper,and onion in food processor or hand dice all veggies into small pieces. Place vegetables in large bowl. Garnish with Sour Cream and/or a slice of Avocado. Mmmmn so many wonderful vitamins in this gazpacho! I love the idea of using V8. Clever! Oh I love Gazpacho! I used to be you were, thinking only hot things were worthy of being called soups until I tasted it! So fresh and delicious! 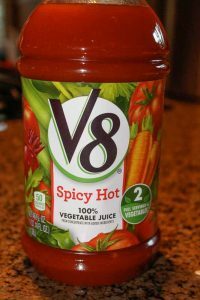 I have never made it with v8 though, I’ll have to give that a try! I’ve never made gazpacho at home! This looks so simple and I love the little shortcut. I need to try this. There’s nothing more delicious and refreshing than a good gazpacho in Summer, your recipe looks fabulous, I’ll try your way next time! I absolutely adore gazpacho. I made a free version this week with all green vegetables and herbs. Are you familiar with that version. It’s fabulous. Your version sounds great. I will be trying this next. I’m also leery of cold soups. It just seems odd to me. I will say this recipe using the V8 is a great way to short cut the process. It’s also full of flavor! Your photos are tempting me to try your aunt’s recipe and maybe, I too will be a cold soup convert. I’m with you….I’m not a cold soup girl either but I’ll be honest….I’ve never tried cold soup! HA! My mind automatically goes to hot! But – I’ll have to give this one a shot! Sounds and looks delish! I’ve never gone crazy for cold soups, but there are a few that I make exception for — gazpacho is definitely one of them! This looks like just the thing for a hot summer night! This sounds like a great recipe! I’m a sucker for anything involving avocado and I love gazpacho! Thank you David! It is a great recipe and I hope you will like it. I love gazpacho and this looks like a good version. Nice post.